“I think it’s a bit small”, I stated the obvious as the female members of my host family giggled. 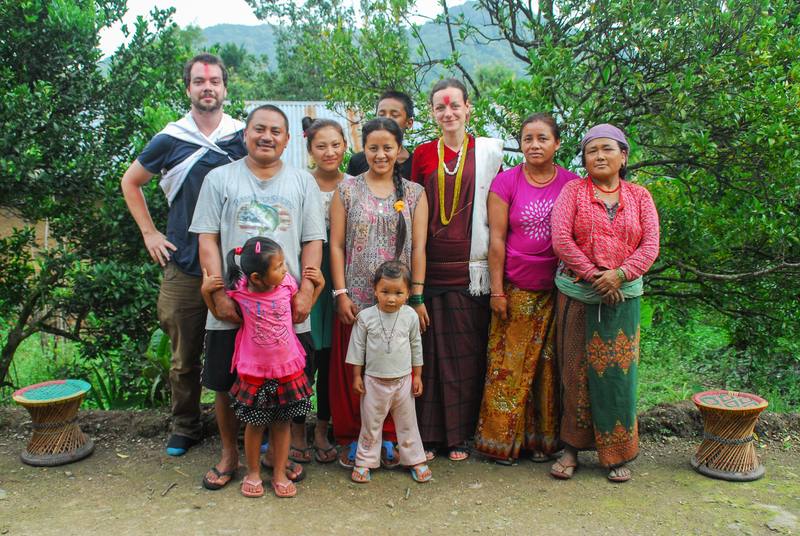 After trading my worn out trousers for a petticoat and a lungi– a wide, floor length skirt that was folded intricately and pinned at my belly- I had unsuccessfully attempted to fit my large Irish frame into a tiny Nepali jacket. With one arm stuck halfway through a narrow velvet sleeve, I stood awkwardly in my state of half-dress in the family living room. Pabitra, my host mother, climbed the wooden staircase in search of a larger cholo (jacket), while her daughter, Trishna, and Roji, a family friend, continued to dress me in traditional Magar clothes for our big night out. Next came a tikiya, a triangle of black velvet that Roji wrapped around my waist and secured with a yellow strip of material called a patuka. She wrapped these tightly around my waist, wordlessly lifting my arms and guiding me to turn around, as Trishna secured the cloth with safety pins. Pabitra soon returned triumphantly with a larger cholo, which she held out for me to slip my arms into. I squeezed myself into the sleeves and then held my breath as it was tightly tied around my chest. Even in the chilly mountain air, I was already covered in enough layers to make me break a sweat. But my stylists weren’t done. They produced a large galek, a blanket of material that they proceeded to drape around my body and knot on my right shoulder. Pabitra then pinned a bangra, a beautiful hand-embroidered white scarf, to this knot, and my new look was completed with a culpeto– a string of colourful pompoms tied around my waist. I stepped tentatively through the doorway to the porch, careful not to tread on my long layers, and grateful for the cool breeze that greeted me. No wonder traditional Magar dress is only worn on special occasions. Even with my mini entourage, it had taken me far longer than my usual prep for a night out. And they weren’t done yet. Now that I was clothed, Roji proceeded to paint my face with makeup, while Pabitra squeezed coloured chura (bangles) over my hands. Trishna then took my hands, which she had decorated in mahendi (henna) the previous day, and painted my nails vivid red. A little velvet dot was stuck to my forehead, which had been streaked with red dust earlier that day. I was happy to discover that the wooden block in my culpeto was to hold an anshi, a curved knife which slid satisfyingly into place. And finally, my new look was complete. My partner Adam had gotten off easier. After failing to wrap a traditional Magar tunic around his larger-than-the-average-Nepali body, the family’s son placed a patterned hat on his head, which refused to move down his forehead and instead sat stubbornly on his crown. This set the whole family off into a fit of laughter at the size of Adam’s head (which, apparently was also larger than that of the average Nepali). Nonetheless, Adam in his tiny hat and I in my elaborate outfit were now party-ready. 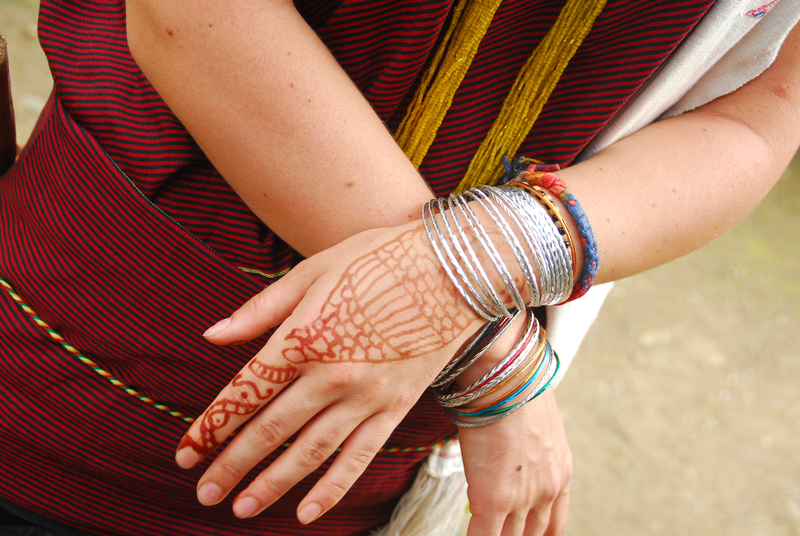 Read more about traditional clothing of Nepal’s Magar ethnic group here. Our drink of choice was mugs of raksi, the family’s homemade millet wine, which we sipped on the porch with the rest of the family, while waiting for the guests to arrive. 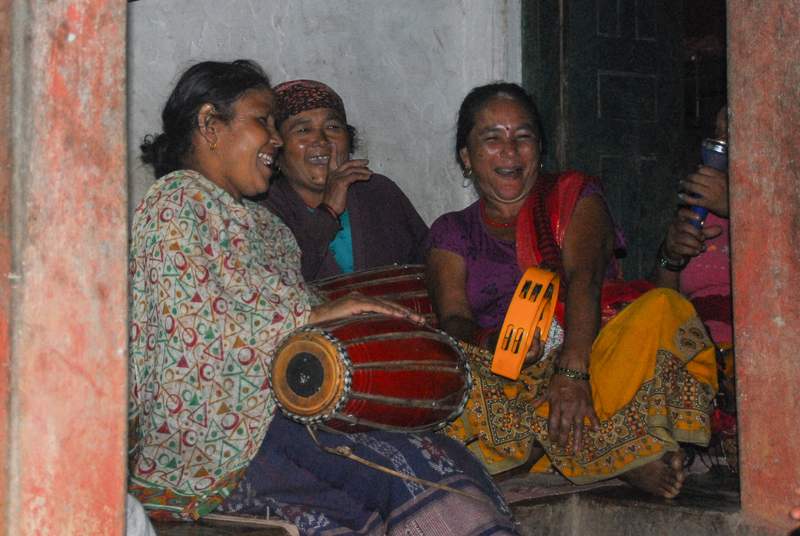 The first to appear were two older ladies carrying drums and tambourines. They sat cross-legged on the porch, and gestured for Adam and I to join. 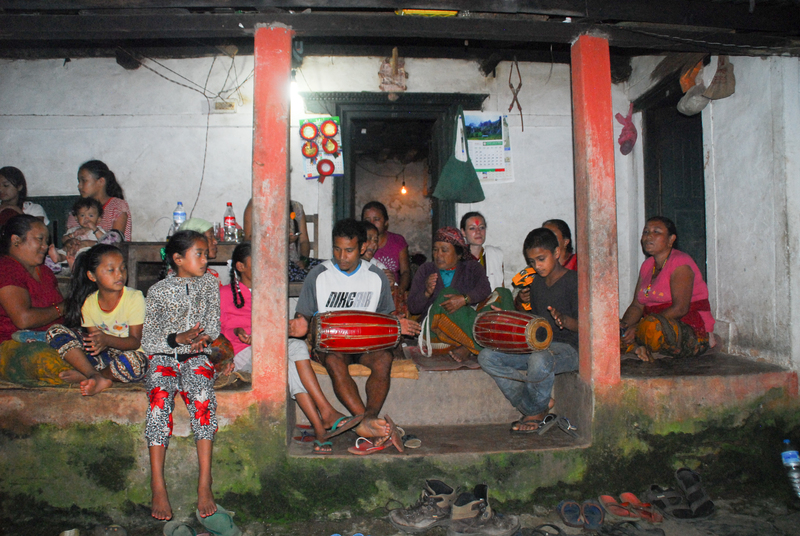 Handing us the tambourines, they began to beat the drums, while singing an indecipherable Nepali song. We bashed our tambourines arrhythmically, to the apparent delight of the old ladies. 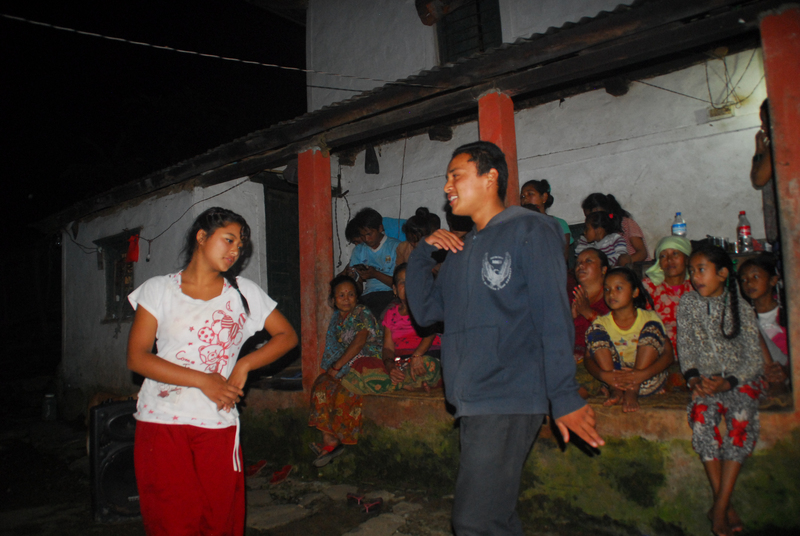 Gradually, the other guests began to arrive, and soon the porch was crammed with what seemed to be the entire village. Having been relieved of tambourine duty, Adam and I sat and watched as the instruments were passed around and the whole crowd began to sing along to the music. One of the older ladies stood and began to dance, delicately flexing her wrists and twirling in time to the music. I squirmed in my seat, certain I knew what was coming next. And sure enough, the dancing woman gestured for me to come join her, much to the enthusiasm of the crowd. I stood nervously and, trying to keep the blood from my cheeks, I began to imitate her movements, albeit far less gracefully. Eventually I was allowed to sit back down, as a few of the men set up a speaker and began to play music via a phone. A young couple stood and began to dance, moving their hips and flexing their wrists while facing (but not touching) each other. When the song ended, the couple sat down to the sound of applause. And apparently it was now our turn. Ushering us to our feet, the crowd began to cheer encouragement, as Adam and I stood facing each other and began to shuffle awkwardly. Adam would later describe this as the most nerve-wracking moment of his life. The night wore on, as more and more couples took centre stage. I danced once more, still without a clue of what I was doing, this time with a young man with a cheeky grin. And then I sat watching the other couples and drinking my raksi. At midnight the crowd began to disperse, and I headed to my room to remove my many, many layers of clothing. I went to bed with a contented smile on my face. It may not have been the wildest of parties, but give me dancing with villagers in the Himalayas over a night bouncing around in a club any day. Great blog! It’s always such a treat to be so immersed and welcomed into such a rich and different culture.